Bones Garage have a knack for elevating the mundane to the sublime. Over the course of the first song, “Great Rift Valley,” from their new record Oi Ma Yeah (which is the incredibly catchy refrain of aforementioned track), I went from perplexed to pleasantly amused to blown away. Their Bandcamp bills them simply as an “Alternative Rock band from Tel Aviv, Israel,” and at first I took the alternative rock tag at face value. However, within two minutes the band had revealed that they had much more up their sleeves: subtle psychedelic flourishes, well-executed rhythmic and melodic shifts, and an invigorating sense of catchiness and playfulness. It seems like these days, almost any band can throw together a series of catchy hooks and call it a day (I have no problem with this; it often makes for great listening). Bones Garage have all of the earworm-like qualities of these bands, but their songs also carry a sustained sense of anticipation that erupts into moments of cathartic jubilance, as in tracks like “Grenades.” However, they can also pull off more mid-tempo fare, like “Toptlopompo” and “Third World Country,” with considerable grace and poise. Ariel Pedatzur’s accented vocal delivery, which is simultaneously cool and full of emotion, adds a richness to these compositions which could have been lacking with a less able singer. Eten Atad’s songwriting seems to be the center around which all of the band’s elements find their orbit, and he contributed to engineering the album, and the thing sounds crystal clear without being sterile. Atad also had a hand in writing the album’s lyrics, which include outside lyrical contributions that he translated into English. The result is a rich tapestry of emotional and musical ideas woven together by a group of capable musicians. The second half of the album gets a bit farther out at points. “Farhud” is a mid-album curveball; it’s waves of distortion sound like a slow-motion version of MBV’s “Sometimes” before abruptly bursting into a beautiful krautrock groove in the song’s third act. “Homo Sapiens Love” uses space and texture to ground lyrics that start out like a normal love song before revealing the weirdness beneath: “You're my home/My air/In every exhalation I breathe your name/You're my comb/My hair/And every hair of yours that I ate /I loved you more.” Much like these lyrics, Bones Garage itself draws you in with the presumption of normalcy before unveiling something much weirder, and more beautiful, than what the surface implies. Check out Oi Ma Yeah here and order a cassette through Austin Town Hall Records. 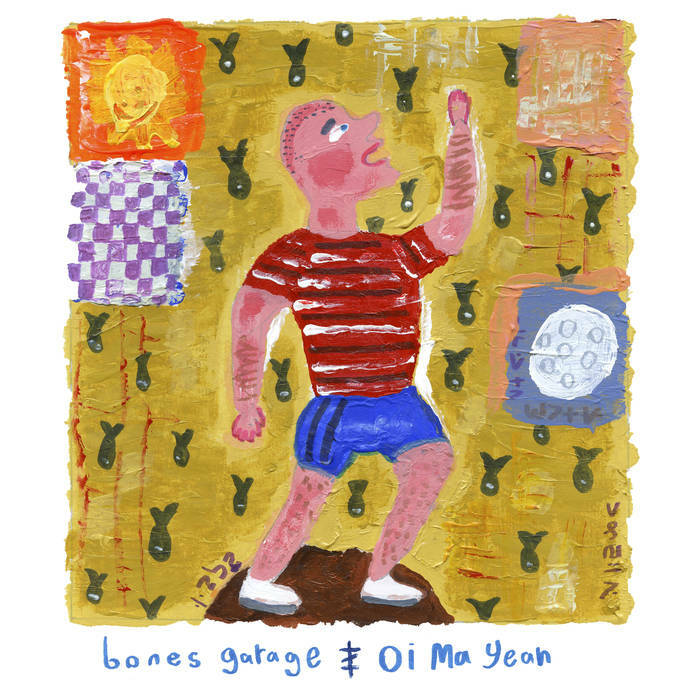 Bones Garage’s Oi Ma Yeah is out March 29th via Austin Town Hall Records.